Customize the fun on a two-hour, story-filled private stroll through the French Quarter, the oldest, most famous, and most unpredictable neighborhood in New Orleans. As the city celebrates the 300th anniversary of its founding, discover the neighborhood where it all started. This tour has history, culture, architecture, and spot-on recommendations for shopping and dining! This private option enables us to customize the route and the content to the interests and comfort of your group. The night before the tour, your guide will send their contact information. Please let the guide know the number of people on the tour (must be less than 28 as per City Ordinance) and any special areas of interest your group has. The tour usually begins in the historic French Market district, but on your customized tour the guide can meet you at almost any French Quarter location. Your guide will also be an enthusiastic storyteller, and the stories in this neighborhood are like no other! Established as a French colonial outpost in 1718, its earliest inhabitants were the quirky, gritty, fascinating types who are still attracted to it today. Every block has a story, and we are ready to share them all with you! 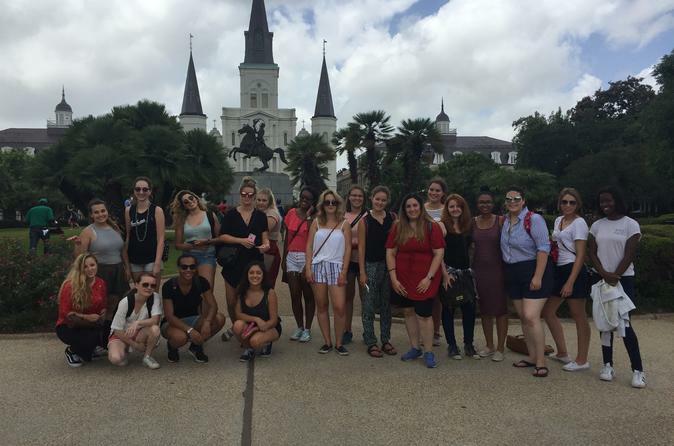 We can give you a general overview of the history and culture of New Orleans, or we can focus on the subjects that you are interested in - jazz, architecture, cuisine, hurricane Katrina, literary history, or famous crimes, to name a few! The tour usually concludes at Jackson Square, but on this customized route, we can adjust to fit your schedule.. Your guide is full of recommendations for enjoying the neighborhood and the city further.